What does the spike in oil prices mean for the dollar? Recent memories suggest that higher oil prices are bad news for the dollar. 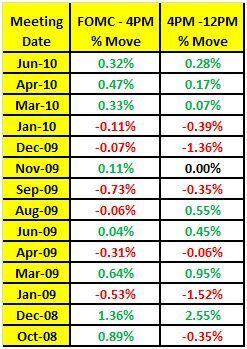 First, we have been used to a generally negative correlation between oil prices and the dollar since around 2004. This was especially the case in the first part of 2008, when the correlation between EUR/USD and Brent reached very high levels. Second, past episodes of tension in the Middle East suggest that the dollar tends to weaken when there are oil supply shocks. This was the case during the first Iraq war in 1991 and in the run-up to the second Iraq war in 2003. 1. High US energy intensity: the US economy is more energy intensive than most other developed market economies. Linked to this, the US is a bigger oil importer than the eurozone. This again means that the US’s terms of trade deteriorate more than other economies when oil prices go higher. 2. Petrodollar flows: When oil prices rise, oil-exporting countries generate more revenue. If a significant proportion of additional revenue is allocated into non-dollar currencies, the net impact can be USD selling. In 2008, when oil prices rose above $100/barrel for the first time, we saw a strong correlation between EUR/USD and oil prices (Figure 2). This correlation is consistent with an increasing share of euro in the reserves of oil-exporting countries, such as Russia and the Middle East. 3. Asymmetry in inflation targets: Oil price shocks affect monetary policy differently in different countries. The Fed tends to focus on core inflation (Greenspan used to focus on the core PCE deflator for example). This means that higher oil prices are not a primary concern in relation to monetary policy. The ECB by contrast focuses on headline inflation, and we have observed in the past that upward pressure on headline inflation from global energy prices (such as in mid-2008) has the potential to trigger rate increases. This asymmetry in inflation targets creates a weak USD bias in the face of oil prices shocks, at least in relation to EUR/USD. Saying the U.S. dollar is falling out of bed would almost be an understatement given the recent price action in the greenback. Over the past three months, the dollar lost more than 10 percent of its value against the euro, Swiss Franc and Australian dollar. Since July, every one of the G10 currencies outperformed the debilitated buck and the latest dollar dump has even driven some currencies to significant highs. The greenback is the one currency that no one wants to own right now but the currencies that are in greatest demand are the Japanese Yen, Swiss Franc, and Australian dollar. The reason why investors are buying the Swissie and Aussie in size is because of their stable economies, healthy economic outlook and correlation with gold prices. The Yen on the other hand is being bought not because their economy is performing better than the U.S., but because investors are seeking safety in low yielding currencies that are not the dollar, the Chinese are buying Japanese bonds, exporters are hedging and carry trades are continuing to unwind their long dollar, short yen positions. Today’s sell-off in the dollar today pushed the euro above 1.40, the Yen to a fresh 15 year high against the greenback, the Swissie and Aussie to a record high. Although the weakness of the dollar can be attributed to concerns about the U.S. labor market, the primary reason why the dollar came under assault is because U.S. yields continue to fall. Of course these factors are related since weaker economic data raises the chance of the Fed following through with additional asset purchases which are bearish for yields, but what is important is that bond traders have been particularly in tune with the market’s sentiment. Two year Treasury yields fell to a fresh record low of 0.359 percent while ten year yields dropped to the lowest level since January 2009. The dollar will continue to fall as long as U.S. yields continue to decline. If there is any hope for a rebound in the greenback, we would need to see U.S. yields stabilize first. 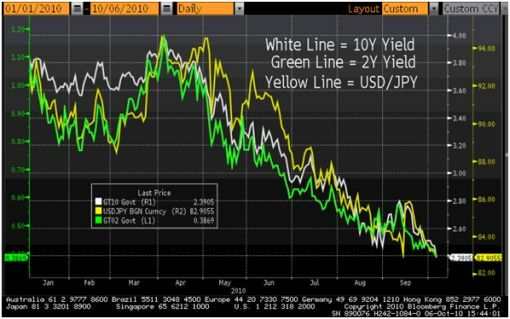 The following chart shows the strong relationship between USD/JPY and U.S. yields. Since the beginning of the year, the correlation between these instruments on a week to week basis has been approximately 90 percent! Trading the Fed meeting is always difficult because in addition to a decision on rates, the tone of the FOMC statement also affects how the dollar trades. Rather than immediately jumping into the market after the announcement, I have found that in 11 out of the last 14 times that the Federal Reserve has met, the move in the EUR/USD during the U.S. trading session continued into the Asian and London sessions. More specifically, the dollar’s move between 2:15pm and 4pm NY time tends to follow through from 4pm to 12pm EST (noon) the following day. The table below illustrates the reaction in the EUR/USD from 2:15 to 4pm on FOMC day and from 4pm to 12pm EST the next day. For forex traders that may not know how to interpret and trade FOMC, this suggests that it may be better to wait and see how the market reacts before jumping in because continuation is very likely.